Welcome back to my November update on my quest to London. November was a big month for me as I ran my first ever Half Marathon! 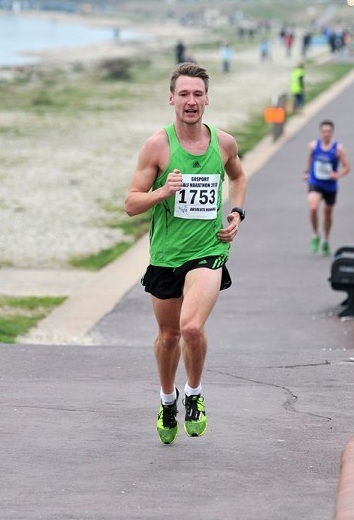 I ran this race with the intention of running the qualifying time for the London Marathon, and I’m thankful to say that I was rewarded for my hard training of late by running 72 minutes and 19 seconds for the 13.1 mile course at Gosport! Being my first half marathon, and coming off more of a sprinters background in comparison, I wanted to make sure that I paced it sensibly and didn’t get carried away with adrenaline in the first couple of miles. I also wanted to make sure that I didn’t need to find another half marathon before the London deadline of 1st January for my entry, so I really wanted to get the time on this day!! After a gentler week of training, I woke up early at 6am on the morning of the race in order to give my body enough time to wake up for the 10am start. The race was down in Portsmouth so my training partner and I set off at 7.30am from Wimbledon, bright and early. After finding that most of the A3 was closed (can you believe it!) we arrived at Gosport 20 minutes before the race, so I grabbed my chip and legged it to the start line where I hopped over the front barrier and joined the front row (cheeky I know, but I couldn’t let anything stop me from running this time). My target pace was 5.30 miling and I wanted to make sure that I didn’t go any faster than this in my first mile! So… after about half a mile I was in about 50th position behind some lads running in football trainers. As I approached mile one, all of those who did get carried away early doors came back to me and I was in roughly 20th position as my Gamin bleeped 5-30 exactly (I was on my way). My paced remained constant until 4 mile to go at which point I decided that I would try and up things… This didn’t quite work. As I increased the effort, my times stayed exactly the same so I guess it’s a good job I had conserved enough energy to feel like I could (even if I couldn’t) step it up. With one mile to go I knew I was safely under the 75 minute taget mark so opened up a bit and crossed the line in 72.19 (5.29 miling) and 11th place. As I reflected on the race, I couldn’t imagine how I could ever go twice the distance by April…. This is something I need to work on, and I understand this now more than ever. More mileage and more speed endurance work right through the winter. But I am motivated! That very night I entered the London Marathon with my new PB and planned my training for the following week. A week and 67 miles later, here I am writing this update and planning my next week’s training. The miles are increasing; I’m feeling fitter and now I’m planning for my next challenge in the build up to London, which will be the Ribble Valley 10k over Christmas. I think running a quick 10k will help me to improve my speed endurance and hopefully make my marathon pace seem a lot easier… we will see. When the New Year comes I will be fully focussed on super long runs so at least, for now, I can focus on some shorter quick stuff and have some fun over 10k. So over the coming weeks, I will try and maintain my milage of 60+ per week in 6 runs and one rest day along with track/road sessions consisting off 6 miles worth of reps (like 6×1 mile off 1 minute or 12 x 800 off 45 seconds). I will let you all know how I get on, so join me soon for another update on the road, mud and paths to London! !